Happy first Friday of March! Hope yall have been enjoying the last little bit of winter. I’m so excited to share these fun (and super cute!) Piggies in the Mud! Also known as Frosted Animal Crackers. They’re such a delicious, nutrient-dense, refined sugar-free, vegan, and gluten-free little treat! I love serving up with some of my Avocado Pudding. You seein’ where the whole “piggies in the mud” comes in?? 😉 I love a good recipe challenge. Taking an unhealthy, common food or recipe, changing it up, and making it as healthy as I can. That’s where these guys come from. 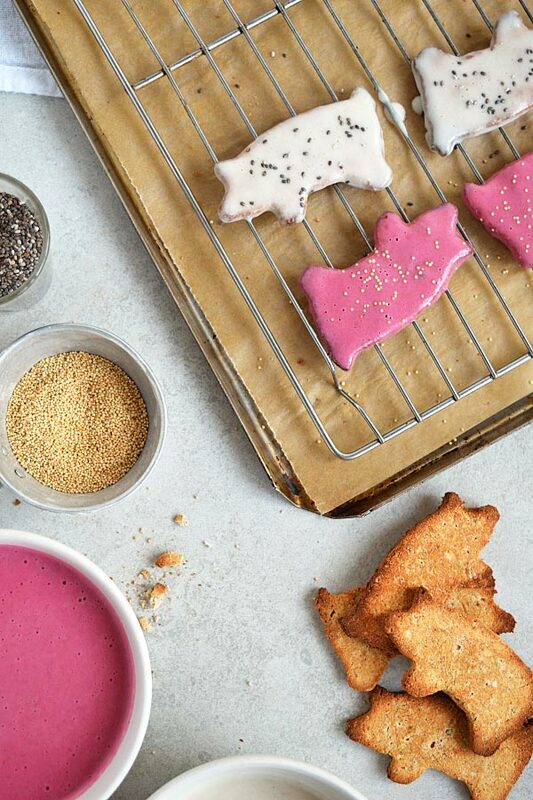 My brother gave me the task of healthifying his favorite “junk food” – those little circus animal crackers with white and pink frosting. I went to work and out came these yummy cookies! The dough was the easy part, as it’s a staple mixture I use for a lot of recipes. Coconut flour, ground flax or chia seeds gelled up in water, date paste, melted coconut oil, vanilla extract, a little cinnamon, and sea salt. Stirred together to form a dough that is pressed or rolled out, cut into animal shapes, and baked until golden. The frosting took a little experimenting, but it came out to be a combination of coconut butter, coconut oil, date paste or other liquid sweetener, a pinch of salt, and splash of lemon or apple cider vinegar. This makes the white frosting. Then I use a little beet powder magic to create that white + pink duo! 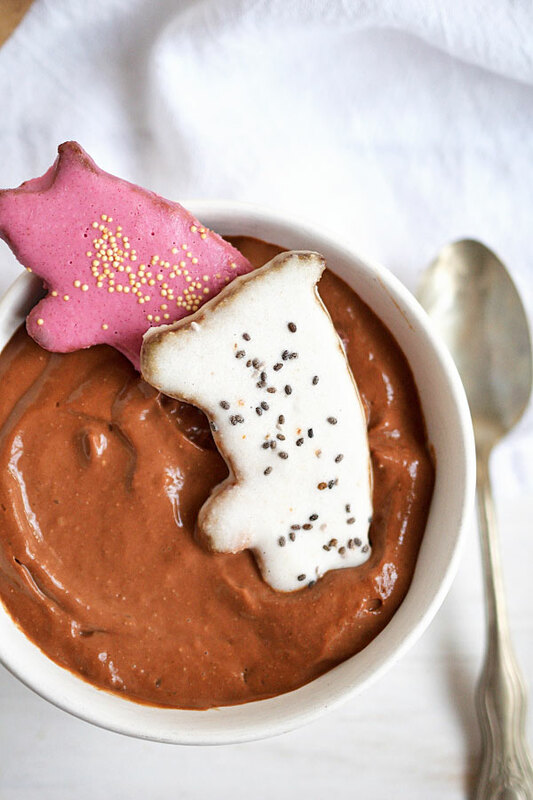 I like using amaranth and chia seeds for some little “sprinkles.” Then the best part. 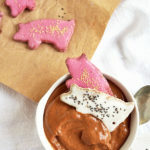 I started serving the cookies with my Avocado Pudding and my sister-in-law started calling them “piggies in the mud” (name credit = all her). I found this old piggy cookie cutter at an antique mall and had to get it just for these. How cute right?? I’m featuring Anthony’s organic extra virgin coconut oil for these cookies. It’s quite the delicious tasting and smelling coconut oil! They cold press their coconuts within 5 days of harvesting, and jar within an hour of pressing, all at the source. This allows for it to not be reheated (preventing oxidation! yippy!) and comes in a BPA-free container. 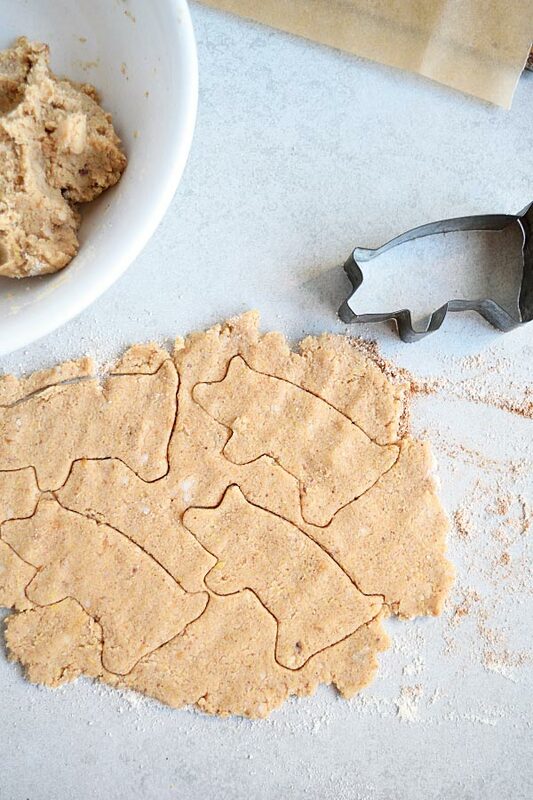 Perfect for these little piggy Frosted Animal Crackers! The dough should be sticking together, but not wet (so not sticking to your fingers). Additional flax will help the dough bind together if it simply isn’t sticking together, while more coconut flour will “dry out” the dough if it’s too wet. For the frosting, only use water in small amounts to thin out if needed. It’s important to not add too much water or the frosting won’t set up. 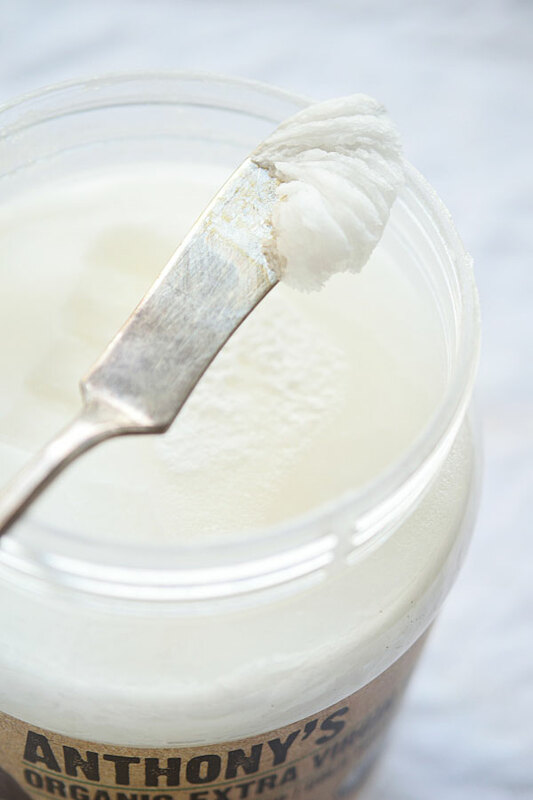 If you feel you’ve added too much water, simply blend in additional coconut oil. Taste both the dough and frosting after mixing to check the status of the sweetness, vanilla, and cinnamon. It’s always simple to add a little more if needed. A fun and healthy take on a store-bought cookie. 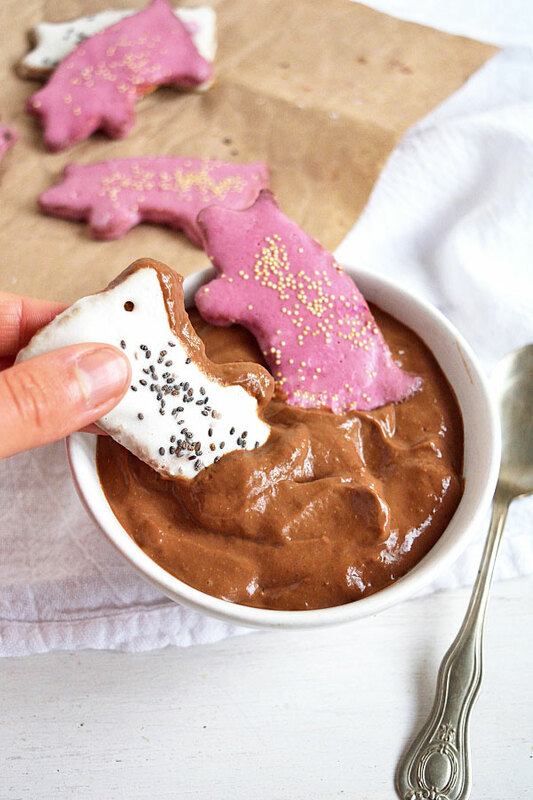 Delicious served with creamy and chocolatey avocado pudding! In a mixing bowl, add all ingredients except for water and stir together. Begin adding water until a dough is formed. The dough should be of consistency where it sticks together easily, but is not wet. If it is sticking to your fingers, add additional coconut flour little by little until it no longer sticks to your fingers, but is still sticking together as a dough. Taste. Add more sweetener, cinnamon, and/or vanilla if desired. Line a baking sheet with parchment paper. Press dough out with fingers, or roll out evenly until about 1/8" thick. Cut with desired animal shape. Lay on parchment paper. Bake for about 30 minutes or until golden brown, flipping halfway. Let cool slightly before frosting. In a blender or food processor, add coconut butter and oil, date paste, a splash of lemon juice, and pinch of salt. Blend until smooth, adding small amounts of water (~1 teaspoon at a time) as needed to thin out until it is similar to a syrup consistency. Taste. Add additional sweetener if needed. Pour half of the frosting into a bowl. Blend the other half of frosting with beet powder (~1 teaspoon at a time) until desired color is reached. Pour into another bowl. Set a cookie sheet on a baking sheet. Dip the cookies into the frosting, lay on the cookie sheet and allow excess frosting to drip onto the baking sheet. Top with desired sprinkles. Put cookies in the freezer for the frosting to set up. Keep in the freezer, or fridge if you want the frosting to be softer. Eat as is or serve with my Avocado Pudding! Enjoy!! Can substitute desired sweetener for date paste: pure maple syrup, coconut sugar, raw honey, or stevia. Ground chia seeds can be used instead of ground flaxseed for the flax egg. These little piggies are the cutest! I remember being OBSESSED with frosted animal crackers, aka basically cookies. These bring out the little 5 year old in me!